BLOOMINGTON, Ill. – Did you know that nearly 75% of the world's crops require pollination? 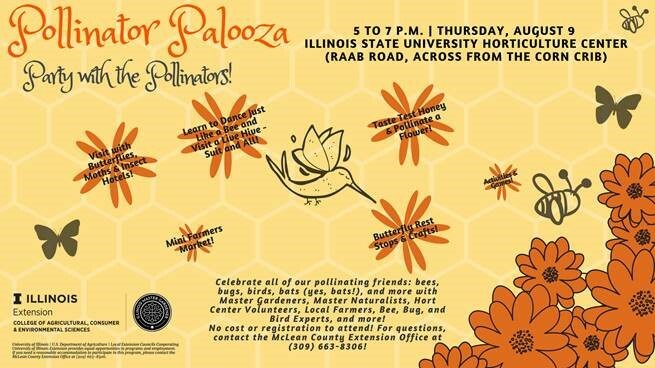 Join University of Illinois Extension and the Illinois State University Horticulture Center as they celebrate the world of pollinators. The Pollinator Palooza: A Party for the Pollinators will be held from 5 to 7 p.m. on Thursday, August 9 at the Illinois State University Horticulture Center, located along Rabb Road in Normal, across from The Corn Crib Stadium. This family-friendly event will have something for everyone, with over 15 community organizations offering a variety of activities and information booths on all things pollinators: bees, butterflies, moths, birds, bats, and plants. Make a hummingbird feeder, learn the bee waggle dance (how bees fly from flower to flower), play pollinator games, purchase pollinator plants and honey, and so much more. Also, enjoy some light refreshments that would not be possible without pollinators, including fruits, vegetables, and chocolate! There is no cost or registration to attend. For more information about this event, please contact the McLean County Extension Office at (309) 663-8306. Come to learn how you can help save the pollinators that are not only critical to our food supply and human survival but make the world a more beautiful and interesting place. For more events like this one, please visit us at our online calendar at go.illinois.edu/LMW. If you need a reasonable accommodation to participate in the event, please contact Brittnay Haag, University of Illinois Extension Horticulture Educator in Livingston, McLean, and Woodford at (309) 663-8306 or bhaag@illinois.edu.